VANCOUVER, British Columbia, March 04, 2019 (GLOBE NEWSWIRE) -- MAG Silver Corp. (MAG: TSX / NYSE A) (“MAG” or the “Company”) reports results from a 48-hole (46,060 metre (“m”)) diamond drilling program on the Juanicipio Joint Venture Property (Fresnillo plc 56% / MAG 44%) completed in late 2018. The program was designed to expand and infill the wide, high-grade Deep Zone Mineral Resource estimate outlined in the Company’s “2017 PEA” (See Press Release dated November 7, 2017). Coincidentally discovered the new Pre-Anticipada vein in the hangingwall above the system. DEEP ZONE WEST: Infill Hole P22: 11.6 metres (true width) grading 783 grams per tonne (“g/t”) (22.9 ounces per ton (“opt”)) silver, 2.57 g/t gold, 6.52% lead, 9.46% zinc, 0.32% copper. DEEP ZONE EAST: Step-Out Hole P26: 6.3m (true width) grading 246 g/t (7.2 opt) silver, 1.78 g/t (capped) gold, 7.20% lead, 11.63% zinc, 0.40% copper. 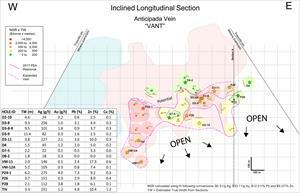 ANTICIPADA VEIN: Infill Hole P24-1: 6.2 m (true width) grading 275 g/t (8 opt) silver, 4.02 g/t gold, 7.28% lead, 9.24% zinc and 0.30% copper. 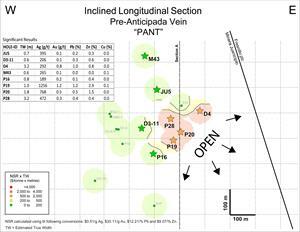 NEW DISCOVERY — "PRE-ANTICIPADA VEIN”: Step-out Hole P28: 3.2 m (estimated true width) grading 472 g/t (13.8 opt) silver, 0.31 g/t gold, 0.39% lead, 0.43% zinc and 0.03% copper. Since the discovery of the Deep Zone as an extension at depth of the high-grade Bonanza Zone (see Press Release April 23, 2015), the Valdecañas Vein System has emerged as a multi-stage, high-grade vein swarm comprising the overlapping East and West Veins, the hangingwall Anticipada Vein, the newly discovered Pre-Anticipada Vein and several other splays (See table and figures below). Exploration drilling is ongoing, running concurrently with surface and underground mine development where first production in anticipated in H2-2020 (as reported by the operator February 26, 2019 - “Fresnillo announces full year 2018 preliminary results”). 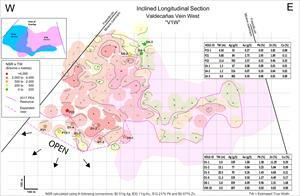 The latest holes include the deepest lateral intercepts to date on the Valdecañas Vein, with deep mineralization now traceable continuously over a strike length exceeding 2,000 m and up to 1,100 m vertically from the top of the Bonanza Zone. Vein widths range from approximately 2 m to over 29 m. Deep mineralization on the Valdecañas Veins remains open laterally for several hundred metres to the claim boundaries on both ends; to the east claim boundary for Anticipada; and Pre-Anticipada and to depth across all veins (see Figures 1 - 5). Notably, the Valdecañas deep zones continue to demonstrate atypically high silver grades that MAG believes are ascribable to stacking or superimposition of later mineralization related to a deeper, fluctuating boiling zone, as well as the increasing copper grades normally expected in the “root zone” of an epithermal vein. Gold grades remain high and remarkably consistent from top to bottom. These phenomena, as interpreted, reflect proximity to a major mineralizing-fluid upwelling zone where multiple repeated pulses of mineralization combined to generate exceptionally high-grade polymetallic mineralization. One Devico directional drill is currently turning on the Valdecañas Vein, with two conventional rigs turning on other targets on the property; additional surface and underground rigs are expected on-site shortly. Eleven new intercepts on the Valdecañas Vein West are reported here (See Table 1 and Figure 1). Three fall within the Deep Zone Mineral Resource estimate (see 2017 PEA) and reinforce those results. The best is P22, which cut 11.6 m (true width) grading 783 g/t (22.9 opt) silver, 2.57 g/t gold, 6.52% lead, 9.46% zinc, 0.32% copper in the heart of the Dilatant Zone (See Press Releases dated August 15, 2016 and February 14, 2017). Three more intercepts are high and confirm the upper limits of the mineralized envelope (See “Shallow Holes” discussion below). The remaining five intercepts are 100 m step-outs designed to extend the resource envelope, the best being Hole P21, the westernmost deep hole on the Valdecañas Vein West. P21 cut 9.8 m (true width) grading 84 g/t (2.5 opt) silver, 2.74 g/t gold, 2.95% lead, 1.89% zinc, 0.11% copper. At the eastern extreme of this zone, Hole D6-1 cut 3.8 m (true width) grading 359 g/t (10.5 opt) silver, 0.09 g/t gold, 0.96% lead, 2.31% zinc, 1.68% copper. The Valdecañas West Deep Zone remains open to depth and laterally, especially to the southwest towards the claim boundary, which lies 200 - 300 m farther west. 1 V1W = Valdecañas Vein West; FW = Footwall intercept. 2 Estimated true widths were estimated from cross sections and core angles. 3 One gold assay capped to 16 g/t from reported values of 16.05 g/t. This is consistent with previous press releases on the Juanicipio project. Twenty-four new intercepts reported here targeted the Valdecañas Vein East (See Table 2 and Figure 2). Six fall within the boundary of the Deep Zone Mineral Resource estimate (see 2017 PEA) and reinforce those results. The best of these is Hole TIV, which cut 4.8 m (true width) grading 278 g/t (8.1 opt) silver, 1.78 g/t gold (capped), 4.88% lead, 10.48% zinc, and 1.20% copper. Five more intercepts are high and confirm the upper limits of the mineralized envelope. (See “Shallow Holes” discussion below). The remaining thirteen intercepts were 50 – 100 m step-outs designed to extend the Deep Zone Mineral Resource estimate envelope. Eight cut strong mineralization with the best being Hole P26, drilled under the middle of the zone, which cut 6.3 m (true width) grading 246 g/t (7.2 opt) silver, 1.78 g/t gold (capped), 7.20% lead, 11.63% zinc, 0.40% copper. Overall the Valdecañas East Deep Zone remains open to depth and laterally, especially in the middle; but it does appear to weaken towards the east at these depths. 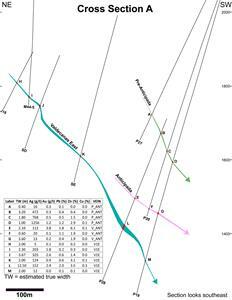 Hole VM-11 is an isolated hole drilled 200 m below the base of the Deep Zone Mineral Resource estimate (see 2017 PEA). It hit thick but relatively weak mineralization in the Valdecañas Vein (See Figure 2) but did cut very strong mineralization in the Anticipada about 120 m uphole (See Below). 3 Two Gold assays were capped at 16 g/t from reported values of 18.45 g/t and 149 g/t. Both 0.70 m core samples. This is consistent with previous press releases on the Juanicipio project. 4 One Gold assay was capped at 16 g/t from reported value of 13.30 g/t over a 0.60 m core length. This is consistent with previous press releases on the Juanicipio project. 5 One Gold assay was capped at 16 g/t from reported value of 65.60 g/t over 0.75 m core length. This is consistent with previous press releases on the Juanicipio project. Fourteen of the holes coincidentally cut the Anticipada Vein 50 to 100m before reaching their primary target, the Valdecañas Vein East Deep Zone (See Table 3 and Figures 3 and 5). Seven fall within the boundary of the Deep Zone Mineral Resource estimate (See 2017 PEA) and significantly expand this vein, especially in a vertical zone along its western reaches (See Figure 3). The best of these is Hole P24-1, which cut 6.2 m (true width) grading 275 g/t (8 opt) silver, 4.02 g/t gold, 7.28% lead, 9.24% zinc and 0.30% copper. The remaining seven holes were 50 to 100m step-outs that served to test the limits of the Deep Zone Mineral Resource estimate mineralized envelope. The three easterly intercepts show relatively weak mineralization but the four westernmost holes extend the strong vertical zone of high-grade mineralization mentioned above. The deepest of these (VM-11) cuts about 150m below the bottom of the Anticipada Vein and reported 2.0 metres (true width) grading 146 g/t (4.3 opt) silver, 0.12 g/t gold, 2.40% lead, 17.32% zinc and 0.64% copper. This is the deepest and westernmost intercept in the Anticipada Vein, which remains open to depth and for several hundred metres towards the eastern property limit. Sixteen of the holes that cut the Anticipada Vein on their way to the Valdecañas Vein East Deep Zone also encountered the previously unknown Pre-Anticipada Vein 50 - 100 m farther into the hangingwall (Table 4 and Figures 4 and 5). The easternmost four appear to form a coherent zone with significant width and grade which is open 200 – 300 m to the east property boundary and to depth. The best hole is Hole P28, which cut 3.2 m (estimated true width) grading 472 g/t (13.8 opt) silver, 0.31 g/t gold, 0.39% lead, 0.43% zinc and 0.03% copper. Notably, Hole P19, 50 m deeper to the west reported 1256 g/t (36.7 opt) silver, a remarkable silver value for this depth in the system. Overall, the results for Pre-Anticipada show strong silver values with the best intercepts lying at an elevation between the base of the Bonanza Zone and the top of the Dilatant Zone of the Valdecañas Vein East Deep (Figure 5). These holes also report very low base metal values indicating a high-level position relative to the epithermal vein zoning model. It is possible that Pre-Anticipada represents mineralization related to postulated deeper boiling zone emplaced into a structure separate from those that host the base metal rich roots of the earlier mineralization stage. Both the Pre-Anticipada and Anticipada Veins are open to depth and for 200-300 metres eastward to the property boundary (See Figures 3 and 4). 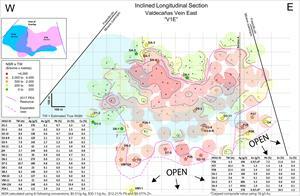 Five holes (SA-1 to 4 and D8-1) were drilled to refine the upper limits of the Bonanza Zone in both the East and West Valdecañas veins (Table 5 and Figures 1 and 2). As expected, all five hit relatively narrow, silver-dominant mineralization except Hole SA-4 which cut 1.7 metres (true thickness) grading 4341 g/t (126 opt) silver, 1.03 g/t gold, 3.14% lead, 5.81% zinc, 0.09% copper in the East Vein. Qualified Person: Dr. Peter Megaw, Ph.D., C.P.G., and Lyle Hansen, M.Sc., P.Geo have acted as the qualified persons as defined in National Instrument 43-101 for this disclosure and supervised the preparation of the technical information in this release. Dr. Megaw has a Ph.D. in geology and more than 35 years of relevant experience focussed on silver and gold exploration in Mexico. He is a Certified Professional Geologist (CPG 10227) by the American Institute of Professional Geologists and an Arizona Registered Geologist (ARG 21613). Dr. Megaw is not independent as he is Chief Exploration Officer (CXO) and a Shareholder of MAG. Dr. Megaw is satisfied that the results are verified based on an inspection of the core and underground exposures, a review of the sampling procedures, the credentials of the professionals completing the work and the visual nature of the silver and base metal sulphides within a district where he is familiar with the style and continuity of mineralization. Mr. Hansen is a registered Professional Geologist with Engineers and Geoscientists BC (149624) and has more than 10 years experience in epithermal veins. Mr. Hansen is not independent as he is Geotechnical Director of MAG. MAG Silver Corp. (MAG: TSX / NYSE A) is a Canadian exploration and development company focused on becoming a top-tier primary silver mining company by exploring and advancing high-grade, district scale, silver-dominant projects in the Americas. Our principal focus and asset is the Juanicipio Property (44%), being developed in Joint Venture partnership with Fresnillo Plc (56%). Juanicipio is located in the Fresnillo Silver Trend in Mexico, the world's premier silver mining camp and we are currently developing the surface and underground infrastructure on the property to support a 4,000 tonnes per day mining operation with the operational expertise of our JV partner, Fresnillo plc. As well, we have an aggressive exploration program in place targeting multiple highly prospective targets across the property. In addition, we continue to work on regaining surface access to our 100% owned Cinco de Mayo property in Mexico while we seek other high grade, district scale opportunities. Figure 5: Valdecañas Vein System Cross Section through Valdecañas East, Anticipada and Pre-Anticipada Veins.